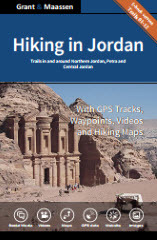 Plan your next holiday in Jordan with the Hiking in Jordan Guidebook and Website. With hiking trails and walks in and around Petra. Including GPS E-trails, tracks and waypoints, videos and planning tools. The trails in this abbreviated version of the Hiking in Jordan Guidebook are in and around Northern Jordan, Petra and Central Jordan. Although most trails can be completed without a GPS device, owners of the book can download 58 carefully recorded E-trails, including trails from other regions not covered by this version of the guidebook, to maximize their time on the trail using GPS enabled smart phones and tablets. The guidebook has been written with the independent traveler in mind, but is also a valuable source of hiking ideas if you plan to organize your holiday with a travel company.